Howdy folks! Just a quick note to let y'all know that we're working on updating the blog's appearance, and we should be done in the next few days—we finally got fed up with the tiny photographs we were forced to use before. Our sincerest apologies to anyone who's been caught off guard by the change ...or who lucked out and saw some of the horrible revisions that took place this morning. Ideally, we would make these alterations behind the scenes, but Blogger doesn't really allow much room for that sorta thing. 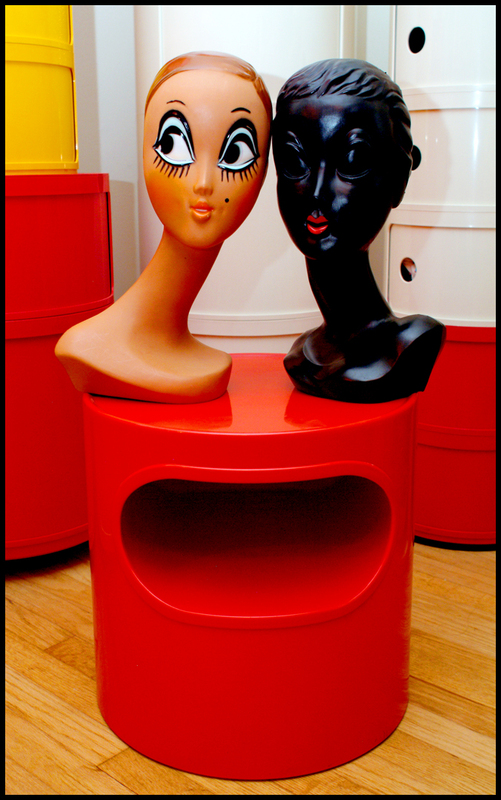 In the meantime, enjoy this brief post showcasing two recent acquisitions that had been on Valery's wantlist for a long time: an original Giano-Giano-Vano side table produced by Artemide and designed by Schweinberger (1966), and two Twiggy -esque mannequin heads produced in France. Thanks again, Marc and Genz! Ha! Thanks, Maxime! I think our jealousy is evenly distributed--keep up the good work! I like the new layout. The header looks rad (the dappled green slurp is a winner)! Red Schweinberger table looks awesome, too! Thanks, Marc! We're still not 100% sure about the header, but I think most everything else is in place. We also wish we would've taken a screen capture of the old blog layout for comparison. This one seems a lot cleaner. 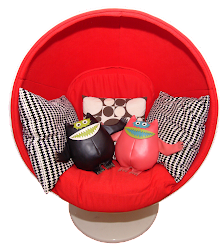 The Twiggy heads creep me out a bit but am glad you like them. Thanks again, Mike. I think you'll be pleased with the other item that your AK47 helped make possible.